Gratitude: A Prayer and Praise Coloring Journal invites you to bring creative journaling and the calming act of coloring into your quiet time with God. This beautifully designed interactive prayer book from Tyndale’s Living Expressions collection helps guide your thoughts as you pray about concerns such as health, overcoming stress, personal relationships, and more. Gratitude gives you a way to celebrate and give thanks to God for the many blessings he provides. Filled with over 100 designs to color, plenty of space for journaling and sketching, and 40 needs-based prayers, Gratitude helps you express your devotion to God with your whole heart! 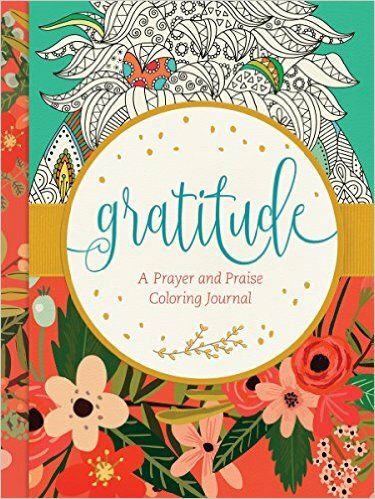 Gratitude: A Prayer and Praise Coloring Journal by Tyndale is absolutely beautiful! I love that Gratitude: A Prayer and Praise Coloring Journal by Tyndale encourages you to journal and color during you quiet time with God. With over 100 designs to color, plenty of space for journaling and 40 needs-based prayers you're sure to love this journal just as much as I do. I've been using Gratitude: A Prayer and Praise Coloring Journal by Tyndale in the mornings and it's completely changes the direction of my days. Having that quiet time alone with God to read, color and journal has been amazing! I highly recommend Gratitude: A Prayer and Praise Coloring Journal by Tyndale. It's the perfect way to start your day! You can find Gratitude: A Prayer and Praise Coloring Journal by Tyndale on Amazon, Barnes and Noble and other bookstores. No More Stink with Bubula JR Steel Diaper Pail! Trudeau Coffee Press Makes Mornings Brighter!